NHL 19 is set to release worldwide on September 14 for PS4, bringing you the most authentic hockey experience to date. Play on outdoor rinks for the first time in the franchise, exploring frozen landscapes that highlight the on-ice action, or hone your edge-work with RPM Tech. Let’s take a look at some of the features that will make NHL 19 so fun to play! Outdoor frozen ponds is where hockey got its start, which is why we’re excited to revisit the roots of the game in NHL 19. Duke it out on a frozen pond surrounded by sprawling environments that have been designed specifically for outdoor action. Step onto the pond and compete in the EASHL, NHL THREES, Play Now and the brand-new modes NHL ONES and Pro-Am. In NHL ONES, you and two other players compete in a 1v1v1 free-for-all gauntlet. 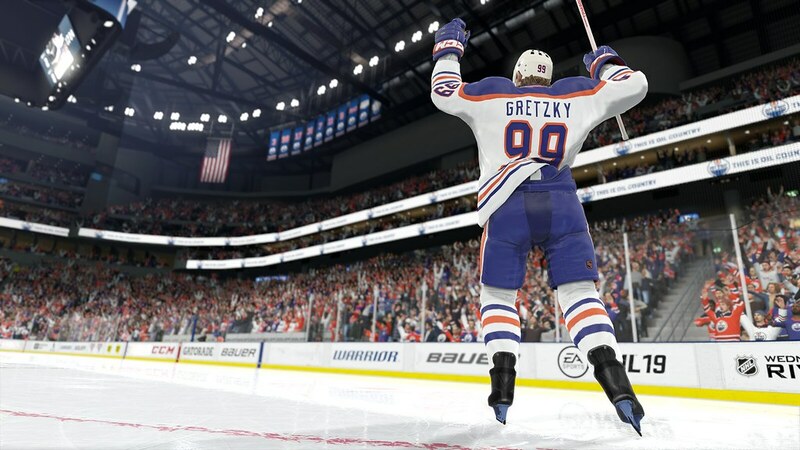 With Real Player Motion Tech, a re-invented physics collision system, and over 900 original item designs to deck out your create-a-player, NHL 19 brings you the most exhilarating entry to the franchise yet. RPM Tech delivers beautiful animations, the ability to accelerate off corners, and movement that was never possible previously. These mechanics give you the ability to explode off the edge of your skates and pick up speed in all-new ways. Express yourself like never before, thanks to the thousands of outfit combinations available to players in NHL 19. 900 new items have been designed with colorful and bold aesthetics, meaning there’s something that suits just about anybody. Show off your personality in the World of Chel, where you’ll compete on outdoor rinks in modes like EASHL, NHL THREES, and many more. Test yourself against the best of the best, or take your dream team up against others as over 200 legends of the game are introduced in NHL 19. Superstars of today’s game playing alongside historical figures of past seasons is another possibility for you to explore, particularly in Hockey Ultimate Team, where you’ll have the chance to build a fantasy team thanks to solo challenges, online play, and much more. P.K. Subban and Wayne Gretzky may be very different in terms of flare and style, but their impact on the game is unquestionable. As this year’s Cover Athletes, these two superstars will represent the spirit of NHL 19. With multiple editions available, these two talented players will have their own covers, as P.K. will represent the standard edition, while Gretzky graces the Deluxe and Super Deluxe covers. NHL 19 is available to hockey fans worldwide on September 14 for PS4. Unlock the full game three days early on September 11 when you pre-order the NHL 19 Deluxe Edition or the NHL 19 Super Deluxe Edition! See the full pre-order details here. I haven’t played an NHL game in a long so I may have to get this one. I hope legends are available in Exhibition and Franchise. Looking forward to outdoors rinks. Did that as youngster in RL, I might even play this game outside in cold for reality.